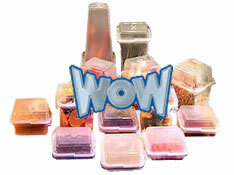 WOW is the amazing interchangeable mix and match storage system. It ensures that you well always have enough space to store your food. The ingenious design of WOW makes every container also a lid at the same time. You can use each piece as a bottom or a top and never worry about having to find the right lid again. The secret behind WOW is the universal interlocking rim. With 4 different sizes you can store all your food whether large or small. With WOW containers you will always have room on top and you will never have to worry about losing storage lids again. These containers are dishwasher and microwave safe. In addition, they can also be stacked together to save space. When stacked together, a set of 20 WOW containers is smaller than a loaf of bread. Right now with this special double offer, you can get a total set of 40 WOW containers for just $19.95 plus the cost of shipping and handling. This includes 20 two cup containers, 10 four cup containers, 8 eight cup containers and 2 bonus twelve cup containers. 3 Comments on "WOW Storage Containers"
Are these storage containers microwavable and dishwasher safe? Can you please let me know where I can order he WOW containers from? Maybe a good idea, but i have had great difficulty fitting these containers together- only one clip works on many of the pieces and you can’t get the other side clip to function- how do I get a refund?